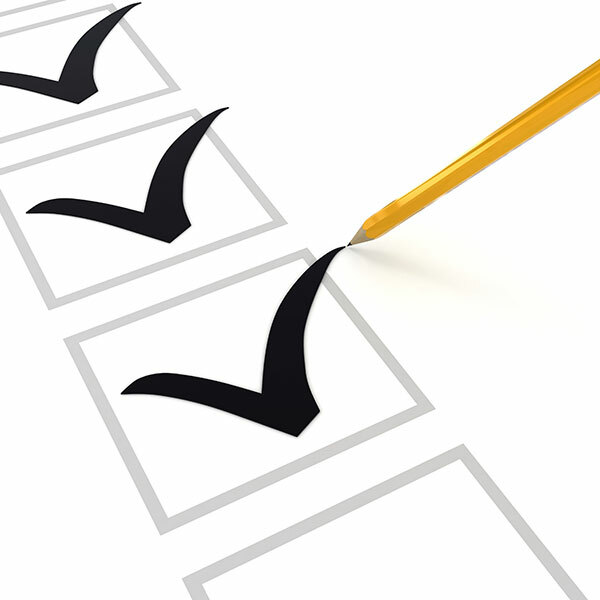 At Ken Rex Plumbing Heating & Cooling we strive for 100% satisfaction in everything we do. We value your opinion and invite you to tell us and others about your experience with us. Please take a few moments to tell us what you think by leaving us a review here on our website or on any of these popular review sites or social networks. Loved the A/C. Hope the heat works just as good. Thank you for the gift! Class Act! The gift was a nice surprise. Thank you Rex. Was well done in a professional manner and in a timely manner too. Well done. Great experience! We love our new ductless system! Very helpful and explained everything really well. Thank you for the cookies and bag! Should have called them years ago. I'm very happy with their service, product and the gals that answer the phone when I call. Always friendly and helpful. I have referred someone to them already. Will buy again in the future. Ken did an excellent job explaining how the ductless A/C system would be installed and how it works. The installers were very pleasant and did a good job installing the system. They even did a small plumbing job for me while they were here. I have used this company for three generations- they respond quickly and their work is excellent. I will be using Ken Rex plumbing again. Pleasant experience from start to finish. Thank You! The ductless unit as recommended by the sales rep really suits our needs. Up to this point, everything is working fine. 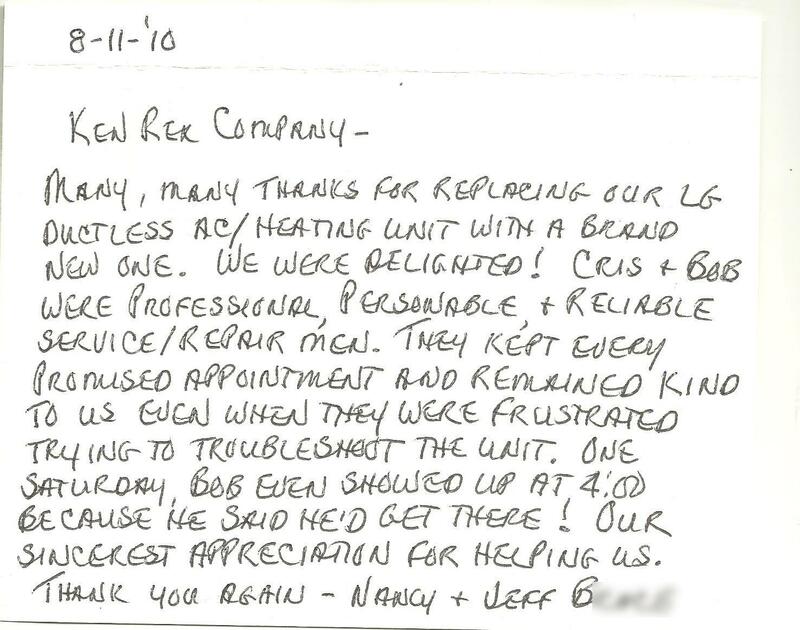 We've been a customer since 1997 when we had a ductless air unit installed & this year Rex installed a combi boiler system, both of which have met our expectations - Ken Rex is & will always be our choice - exceptional service & always there for us - we would recommend Ken Rex to anyone. Material ordered and installed earlier than expected. Job well done. We exceeded our timeline. Everything was explained in detail. The crew were very courteous and very knowledgeable. Ken Rex has been great to work with, since his team installed our first split system about 25 years ago. We've since had a replacement system and another new one just recently installed elsewhere in our home. Whenever we've needed service, they've been great, even during their busiest times! I've recommended Ken to many others over the years, and would not hesitate to recommend him and his team again! Very pleased with their work, service, and most especially, Ken is just a really nice person. I had an excellent experience with Ken! I would recommend you to anyone in a heartbeat! Great, fast, knowledgeable service! Nothing but praise all around, work completed on time with no inconvenience to us. Personnel professional and courteous, great price; obviously take pride in their company. All is good. Thank you for the cooler and cookies. Very professional, courteous. Explained every step. Fast installation. Satisfied in every aspect of the purchase. Prompt, friendly service... quality product and installation. Personal attention by company owner. Very professional experience. We are totally satisfied with the air conditioning units. Friendly, courteous with high regards to our needs. Complete satisfaction. Great to do business with. Friendly, knowledgeable, and courteous. Always professional, courteous and accommodating! Gave my neighbor your name who is looking into ductless air. Ken and his crew were great morning of installation with final placement spots for ac units resolution with moving them from initial spots discussed. In the end they were right and we definitely get the cooling of our house we were looking for. We are very pleased. Thank you! A job well done, like usual. Very happy with everything! Would highly recommend the business. Great service/people! The cookies - Delicious - Thank you!! Product is quite, efficient, and electric bill went down by $80 the first month of use. Can't wait for the winter to see how the heating system will work. I would recommend to everyone. I truly appreciate the professional service Ken Rex Plumbing and Heating provides. During a recent heatwave, my ductless AC decided to quit. A technician was dispatched that same day to check it out. Unfortunately, the system was not repairable. After discussing options, I selected a new improved system. I received a fair price and prompt, professional installation. The technician took time to explain everything and answer all my questions. I have also received this type of service for my heating and plumbing issues. I highly recommend Ken Rex Plumbing and Heating. Ken Rex met our needs and exceeded our expectations. Ken Rex' ability to satisfy tight schedule requirements is fully appreciated. The multi zone system is performing well. Ken Rex' crew did a quality installation. I highly recommend Ken Rex to anyone needing heating or cooling work. They are very professional and knowledgeable. Experts in their field. Thank you! It was a very good experience, put the unit in no problem and cleaned up and put everything back in place. Appreciated the personal, courteous attention given to our needs, requests and most helpful suggestions that were offered and implemented. Continued their effort to find the problem...then seek a proper answer. Ken was very knowledgable of his product and presented well. He left no questions to be asked. Very satisfied! I have no complaints and would give your name to others who are looking for air conditioning. We are more than happy with our experience. Ken, Chris and Eddie were polite, thorough and a joy to have in our hope. Thank you for the high level of integrity we found with your company. 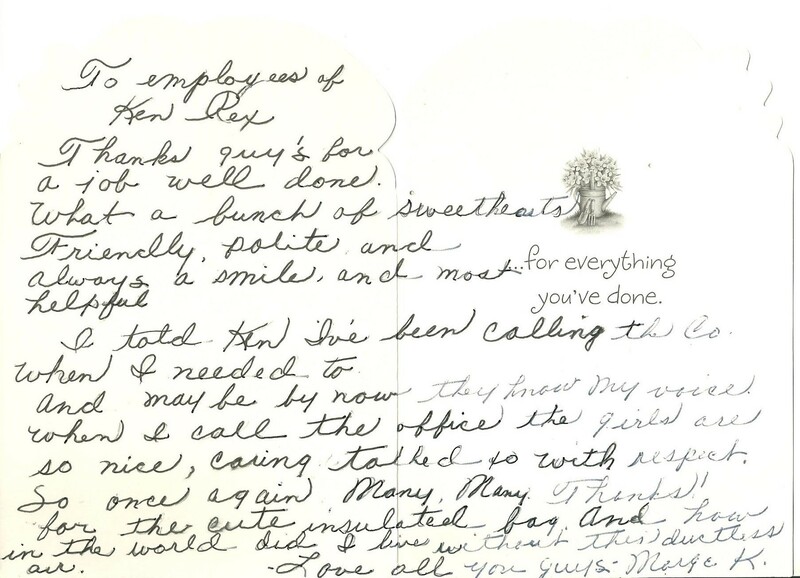 Ken Rex and employees are wonderful! They always do a great job and a professional job! We would always recommend Ken Rex to everyone. Chris, Jimmy and Ed did a good job on the Duckless unit. Thank you for the cooler bag and delicious cookies that we enjoyed. That was so nice and thoughtful of you. I will tell everyone it was the best investment that we made to our house. Ken, two girls in the office are sweet and kind to talk to and are very helpful! Overall, felt like Ken and company cared about getting the job done right and in a timely manner. Appreciated the level of professionalism and courtesy shown to me - not something you often find these days. Ken knowledge was very helpful on choosing the correct product to fit my needs. Love the new system and hope to see reduced energy bills next winter. The space it saved is remarkable. Installers were the best and Ken R. is a customer oriented owner. 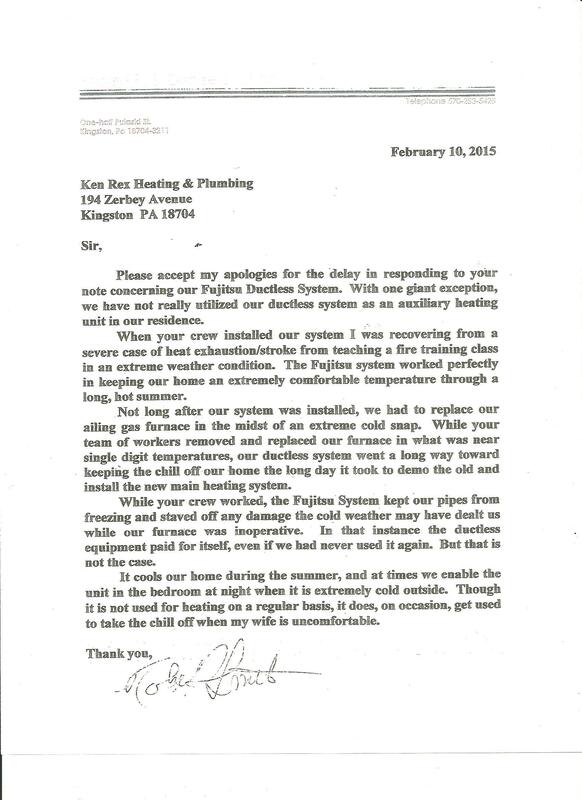 Please accept my apologies for the delay in responding to your note concerning our Fujitsu Ductless System. With one giant exception, we have not really utilized our ductless system as an auxiliary heating unit in our residence. When your crew installed our system I was recovering from a severe case of heat exhaustion/stroke from teaching a fire training class in an extreme weather condition. The Fujitsu system worked perfectly in keeping our home an extremely comfortable temperature through a long, hot summer. Not long after our system was installed, we had to replace our ailing gas furnace in the midst of an extreme cold snap. While your team of works removed and replaces our furnace in what was near single digit temperatures, our ductless system went a long way toward keeping the chill off our home the long day it took to demo the old and install the new main heating system. While your crew worked, the Fujitsu system kept our pipes from freezing and staved off any damage the cold weather may have dealt us while our furnace was inoperative. In that instance the ductless equipment paid for itself, even if we had never used it again. But that is not the case. It cools our home during the summer, and at times we enable the unit in the bedroom at night when it is extremely cold outside. Though it is not used for heating on a regular basis, it does, on occasion, get used to that the chill off when my wide is uncomfortable. Every dollar well spent. And the installers were the best. Number 1. We are very satisfied with our unit and feel that it's the best investment we ever made. We will refer you to friends and family if need be. As in the past, Ken Rex Plumbing and Heating did an excellent job for us. We have always received great installation from their installers, helpful and polite office staff and Ken Rex is a great guy to deal with. Will always call them in the future and also will refer friends. The thank you gift was a very nice idea and appreciated. We will use it. It's been a good experience! I will definitely recommend to others. The installers were very knowledgeable and very polite. They did a very good job and cleaned up everything. We are very happy with our dealings with Rex heating and air conditioning. Very happy with the air conditioner. A well designed system - works great! We are very well pleased with our 2 air conditioners. Ken and his staff are helpful, customer oriented professional etc. a rare experience these days. This man knows his business. His price wasn't the lowest but I wanted the job done right. Professionalism and total service and explanation. I would like to thank Bob (repair person) for the work he did getting our system to work temporarily until a permanent fix could be made. Love the work and very excellent customer service. 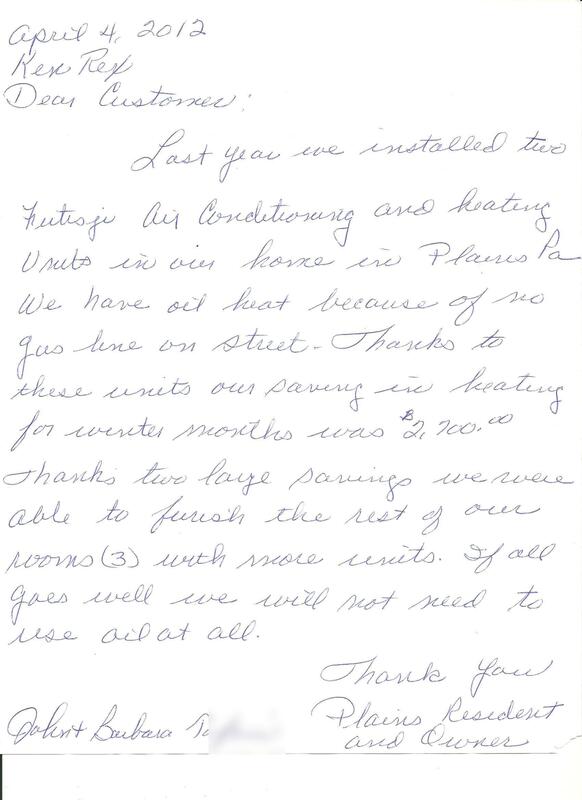 Last year we installed two Fujitsu Air Conditioning and heating units in our home in Plains PA. We have oil heat because of no gas here on street. Thanks to these units our saving in heating for winter months was $2,700.00. Thanks to large savings we were able to furnish the rest of our rooms (3) with more units. If all goes well we will not need to use oil at all. Many, many thanks for replacing our LG Ductless AC/Heating unit with a brand new one. We were delighted! Cris & Bob were professional, personable, & reliable Service/Repair men. They key every promised appointment and remained kind to us even when they were frustrated trying to troubleshoot the unit. One Saturday, Bob even showed up at 4:00 because he said he’d get there! Our sincerest appreciation for helping us. Thank you again. Thanks guys for a job well done. What a bunch of sweethearts. Friendly, polite and always a smile, and most helpful. I told Ken I’ve been calling the Co. when I needed to and maybe by now they know my voice. When I call the office the girls are so nice, caring, talked to with respect. So once again, many, many thanks for the cute insulated bag and how in the world did I live without this ductless air. 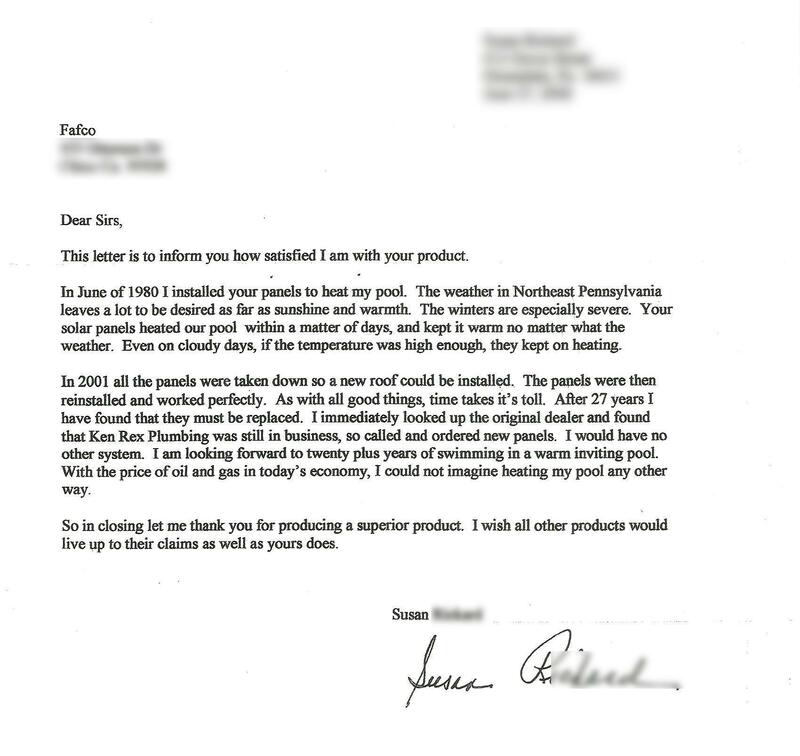 This letter is to inform you how satisfied I am with your product. In June of 1980 I installed your panels to heat my pool. The weather in Northeast Pennsylvania leaves a lot to be desired as far as sunshine and warmth. The winters are especially severe. Your solar panels heated our pool within a matter of days, and kept it warm no matter what the weather. Even on cloudy days, if the temperature was high enough, they kept on heating. In 2001 all the panels were taken down so a new roof could be installed. The panels were then reinstalled and worked perfectly. As with all good things, time takes its toll. After 27 years I have found they must be replaced. I immediately looked up the original dealer and found that Ken Rex Plumbing was still in business, so called and ordered new panels. I would have no other system. I am looking forward to twenty plus years of swimming in a warm inviting pool. With the price of oil and gas in today’s economy, I could not imagine heating my pool any other way. So in closing let me thank you for producing a superior product. I wish all other products would live up to their claims as well as yours does.